We’ve all been there: staring in front of the mirror wishing our nose was smaller; our waist thinner; our height taller. Luckily, over the past few decades, society has been collectively moving toward a new way of thinking. Rather than simmering with unkind thoughts of ourselves, we are slowly learning to accept our bodies. In the past couple of years, body positivity is bubbling over onto social media too. This trend is spreading the ideas of being body positive in ways that are causing big waves throughout the world and it prompted us to take a look at how people are expressing body positivity on social media. We wondered how many people were talking about it and which parts of the country were spreading the message more than others. For our analysis, we chose Instagram for its visual media and community-driven hashtags. 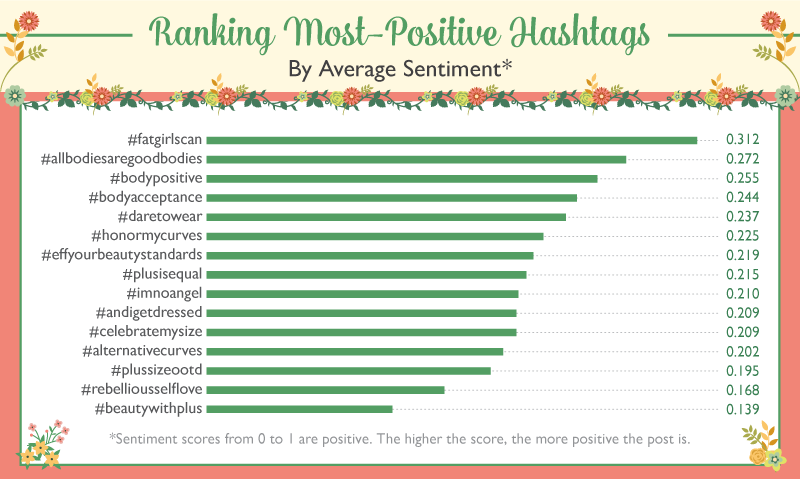 We also examined the U.S. states that had the most use of body-positive hashtags Finally, we assigned a sentiment score to understand the love and hate behind these images. Read on to find out how your state shapes up. Which States Are Most Body Positive? Cultural trends vary throughout the U.S., and as the body-positivity movement has taken off, some regions have embraced the trend more than others. Certain states might simply use social media more overall, or they might have more of a “health conscious” attitude toward life and self-care. Regardless, body positivity is important no matter where you live. 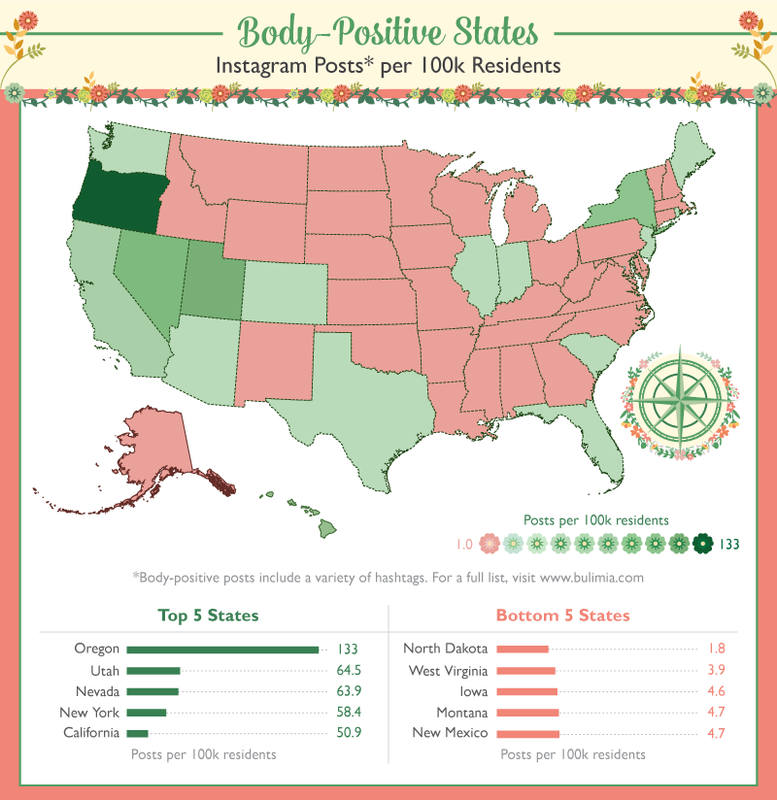 By a long shot, Oregon residents have contributed the most body-positive hashtagged posts. Other states that made the top of our list? Utah, Nevada, New York, and California. The bottom five states include New Mexico, Montana, Iowa, West Virginia, and North Dakota. Do you live in one of these states? Now is a good time to help spread body positivity messages and join the movement. Check out some of the hashtags below to learn the language of loving your body. The rise of hashtags has given us the ability to connect posts with related interests on Instagram. For many of us, that is how we find each other, join forces, and encourage others. A few mainstream internet celebrities have taken on leadership roles within the body-positivity community. Some even have their own social media accounts that have helped to promote popular hashtags and increase overall visibility of the movement. The most popular body image hashtag is #effyourbeautystandards, which is associated with a popular Instagram account by the same name. (The account is run by the beloved plus-size model Tess Holliday.) The phrase is used in about a third of all body-positive posts we looked at, and the hashtag garners an impressive average number of likes (183 likes per post). Perhaps not surprisingly, #bodypositive is also used a little more than a quarter of the time. In the graph above, you can see many of the other hashtags that are often used. It could be easy to accept these hashtags at face value, but often they are used in a derogatory way that is not body-positive or empowering. That said, many people have taken those kinds of discriminatory posts and inverted them, turning them back into positive messages. Maybe you have even seen many of these ideas in meme form. People from all walks of life are talking about embracing their fat, stretch marks, and cellulite. These trends have appeared in social media and can be easily tracked through popular hashtag use. We used a sentiment analysis tool, Textblob, to determine the average level of positivity for each popular hashtag. The tool looks at the words surrounding the hashtags and gives a numbered score to each post; the higher the score, the more positive the posts were overall. The hashtag that came out on top was #fatgirlscan, which is now commonly used as a term of empowerment. Though the label “fat” has often been laced with negativity and discrimination, users of this hashtag are following a trend in which individuals are reclaiming the term “fat” and reframing it in a positive way. 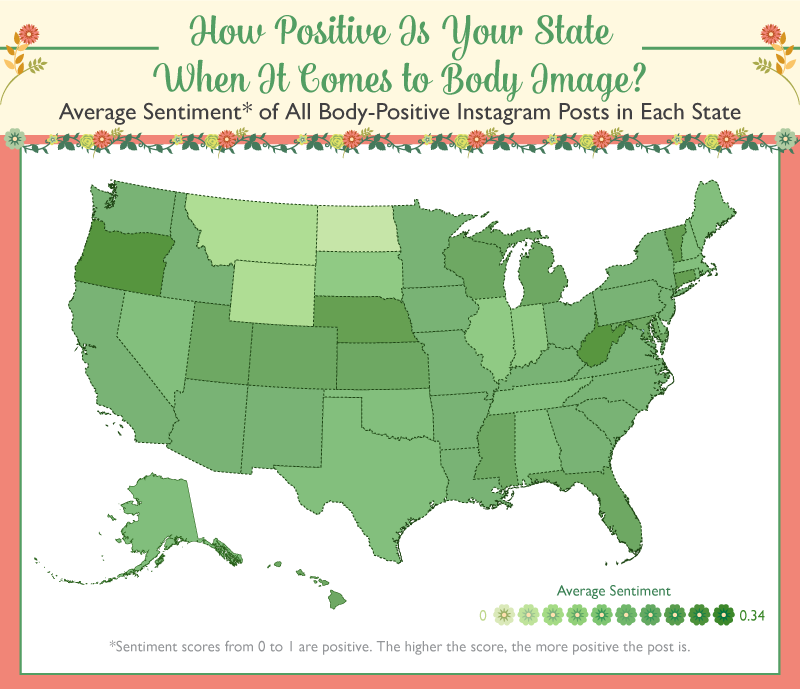 How Body Positive Is Your State? Body-positivity rates vary across the country, sometimes being influenced by population, and other times being influenced by the general “personality” of a region and its overall willingness to adopt social movements and trends. People struggle with body image issues everywhere, however, the body-positivity movement is relevant in all 50 states. How does your state stand up to others? We compared the average positivity sentiment among the states; you can see the average ratings in the map above. It appears that most states have admirable levels of body-positive posts on Instagram, with a few that are doing exceptionally well. Oregon and Vermont are two of the states that rate highest. Both places are relatively well-known for their emphasis on health consciousness, which may explain why they also rate high on body positivity. Thankfully, body positivity has become a prevailing social trend in our culture and with the rise of social platforms such as Instagram, this message can be shared with individuals all around the world. This is a powerful movement, with the potential to save the lives of individuals in United States and also around the world. Many individuals have body image issues, and recovery can sometimes be a frustrating and unforgiving process. However, it’s well worth the fight. By posting photos and adding positive, trending hashtags, you can join the body-positivity movement, change how you feel about your body, and more importantly, help encourage others to love their bodies as well. Tagging Instagram photos with #bodypositive, #effyourbeautystandards, and other uplifting hashtags may have a profound impact on someone’s life and help them view their own body in a more positive way. If you or a friend is struggling with body image or the burden of an eating disorder, visit bulimia.com to find life-saving information and get the help you deserve. 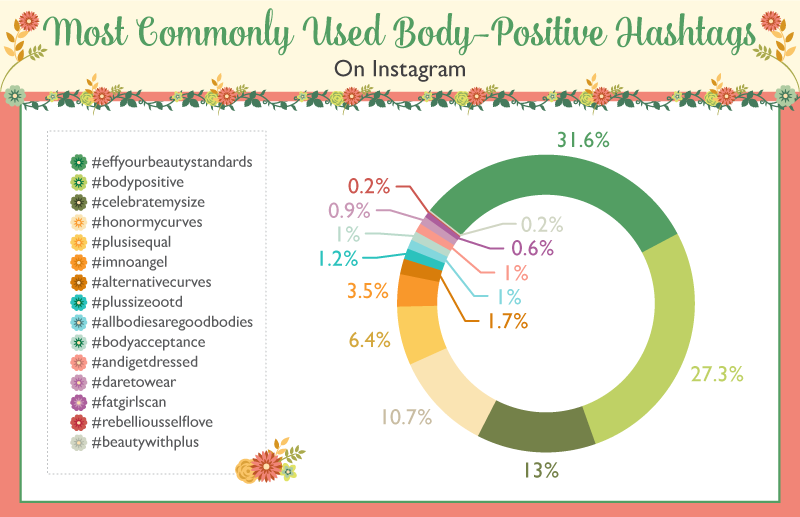 We chose 15 of the most popular body image hashtags used on Instagram and ran a program to extract the analytical data used for this project. We were able to determine the most popular hashtags per 100,000 residents by combining the total number of body-positive hashtags for that state. We found the most commonly used hashtags by combining each state’s use of the hashtags. We then ran each hashtag through a program called TextBlob to determine the positivity of each hashtagged post or the overall positive sentiment of the state using the hashtags included. We encourage you to enjoy, share, and use the images on this page. In return we ask that you link back to this page so your readers and friends can have access to our original research. Bulimia.com isn’t just about helping people suffering with Bulimia Nervosa, we provide information for anorexia, binge eating and any other eating disorder. Don’t let food-related issues cause you pain, embarrassment or jeopardize your health - get informed and get help! Bulimia.com is operated by Recovery Brands LLC, a subsidiary of American Addiction Centers, Inc. Learn more about what this means here. Copyright © Bulimia.com 2019 | Bulimia.com is operated by Recovery Brands LLC, a subsidiary of American Addiction Centers, Inc.